Today was the day the last of us went home. And an epic journey it was. The earliest of us was up at 5:15 to shower then pack the frozen samples into styrofoam fish boxes that Jussi was lending us (and did get a fright upon discovering a dead, frozen-solid, glassy-eyed, ungutted, undissected fish in a tray underneath the samples in the top drawer of the large, vertical freezer). 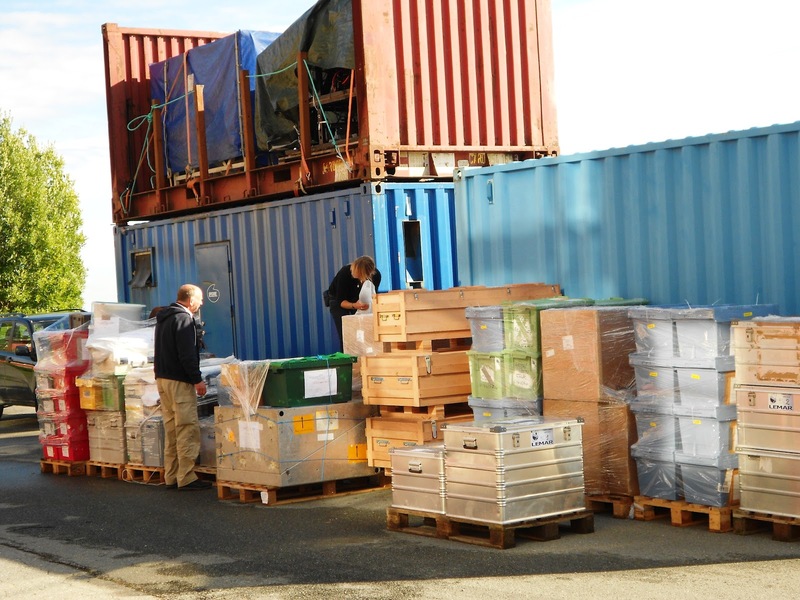 By 6:30, the samples were all packed (thanks to additional help from Sari and Annick) and it was time for breakfast. Most of us stared bleakly into cups of coffee and tucked a banana into our carry ons for an hour when stomachs might no longer be groggy. 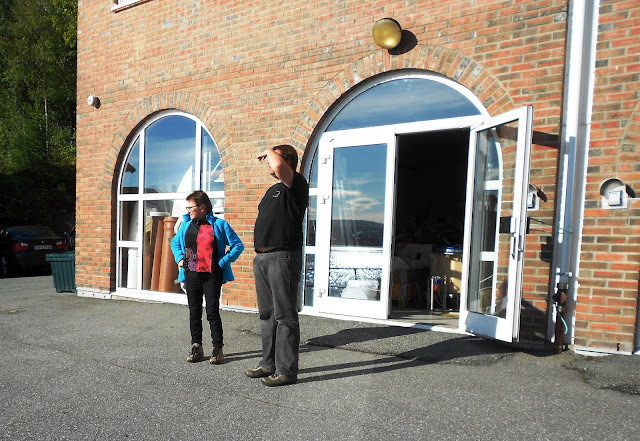 By 9:05, the 9-seater rental van, the Land Rover, the 3 dewars of liquid nitrogen, the boat, all of us, and all our frozen samples were at the bio station at NTNU, on the outskirts of Trondheim (which is a beautiful place, at least as gazed from across the water, which is still, really, the only way I have seen it). Aug 29 2012a- The bio station at NTNU. 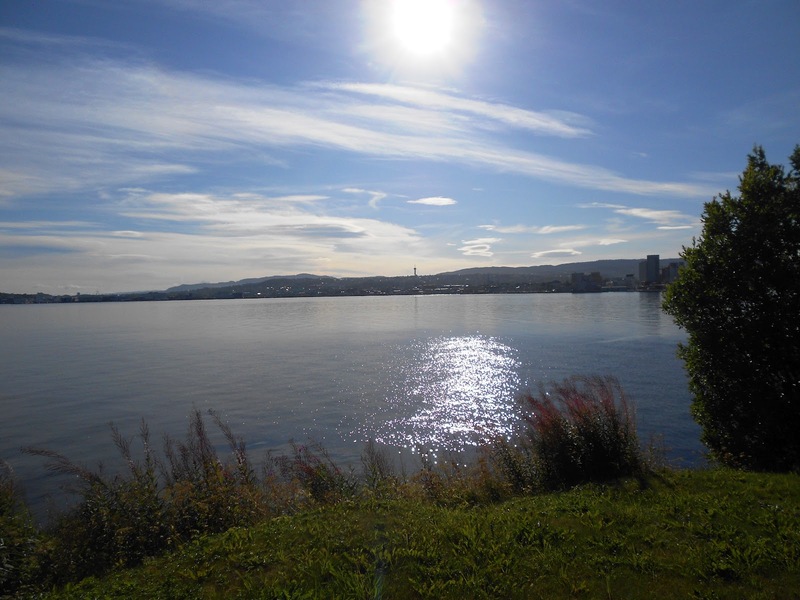 Aug 29 2012b- Trondheim from across the water. 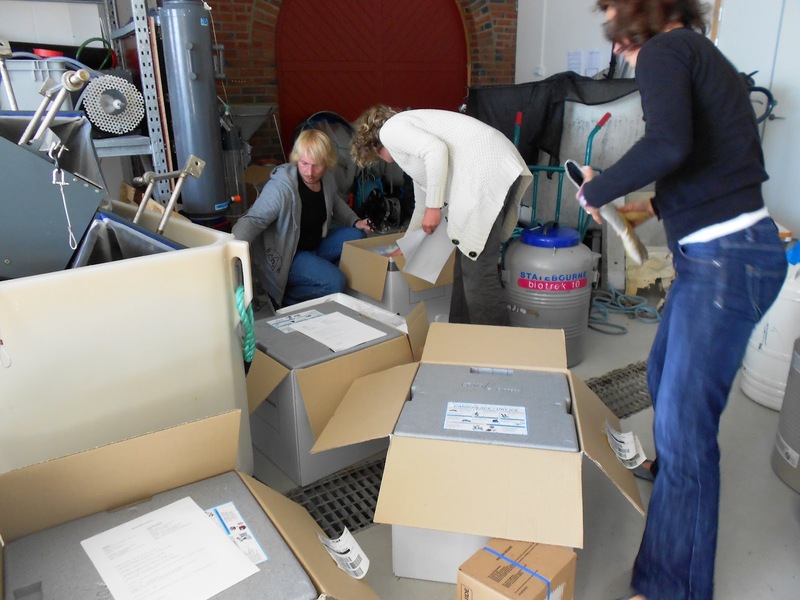 Our dry ice and shipping containers had arrived the night before and it took an extremely determined Briva, Morten, Annick, Morgane, and Manon to compress the frozen samples into the 4 small shipping boxes, but somehow they succeeded. Aug 29 2012c- The frenzied repacking of frozen samples into express shipping boxes with dry ice. Aug 29 2012d- Old friends on the dock in front of the bio station. Aug 29 2012e- It was a gloriously lovely, warm day, so bright you had to squint. Aug 29 2012f- Making last minute adjustments to their pallets, including replacing crumpled, rain-soaked address labels. By 9:51, we had said goodbye to Sari, who was off for 3 days of hiking with a friend, and were en route to the airport. By 10:30 we were there. Shortly after that, we were checked in. We said goodbye to Jussi, who by now seemed like an old friend, and went off to smoke or sit somewhere with some sort of cup of caffeine. Then 11:22 rolled around and, just as we were saying goodbye to Richard (who was flying to Oslo then London), up flashed on the monitor that people on our flight to Amsterdam should report to the gate, even though we were not meant to board until 11:50. Sensing immediately that this was bad news, I beelined to the gate. Bummer. Hugh crowd of unhappy travelers around it and one man dispensing information altnernately in Norwegian and nearly indecipherable English. The gist: one of those relic of WWII bombs was found at the airport and now (presumably because at least one entire terminal had been evacuated), the Amsterdam airport we were connecting through was experiencing "capacity problems" (And the discovery of the old bomb had come immediately on the heels of a Spanish flight to which the control tower had lost contact and had to be escorted in by fighter jets primed to shoot it down at the first sign that it had been hijacked and, well, you know, was headed for something (the year's entire tulip crop?) it would be bad to fly a jumbo jet into.) In short, flights within the EU were not going in or out of Schiphol, so while our flight from Norway would land (although about an hour late), unless we wanted to fly to Shanghai instead of connecting on to Paris (or in Morten's case, Bremen), we needed to change our tickets. In fact, our bags had already been offloaded and our tickets cancelled. At this point, Morgane, Annick, and Manon appeared in the international terminal and I told them the bad news. It took us about 15 minutes to figure out where we were supposed to find our bags (there being nobody really telling anyone anything except that you had to take back your duty free goods and get a refund, since you were now obviously not going to leave the county). By the time we found our bags and dragged them back upstairs to ticketing, the line was a million miles long. Oh no. Was there any chance of us getting to the front of the line today, much less home before tomorrow? 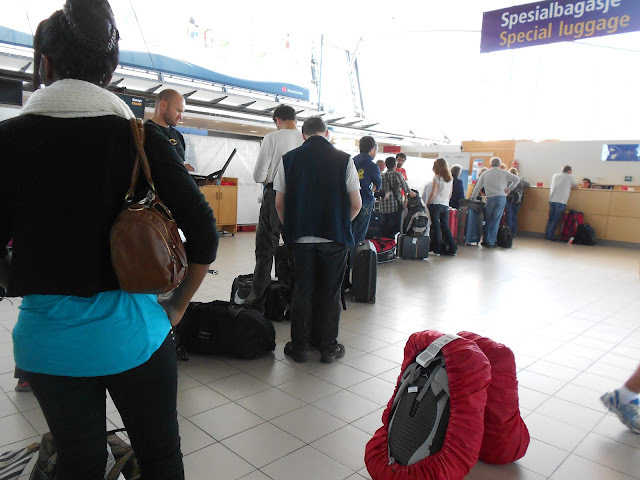 Aug 29 2012g- The long, basically non-moving line for rebooking flights. Aug 29 2012h- The Brest team is less than impressed. Happily for us, however, Briva and Morten had still been in the part of the airport where announcements could be heard and understood and turned out to be at the head of the long line we were standing in. It took about 20 minutes of emphatic discussion, but they managed to rebook all 6 of our tickets with the Brest team arriving back to Brest on exactly the same flight from Paris as we were supposed to and Morten arriving in Bremen about 5 hours later than planned, and with a detour through Bergen and Frankfurt. Aug 29 2012i- Flights sorted. 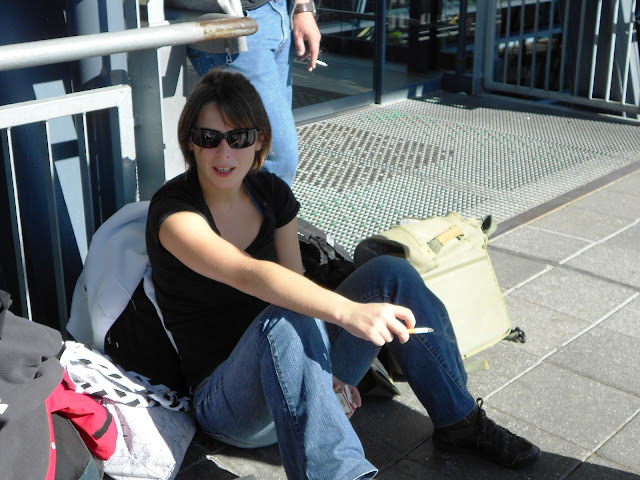 Time for a calm, cool, hip, and collected cigarette in the sun outside the terminal in Trondheim. Sunlight and nicotine stocked up on, we went back in and back through security to spend the equivalent of 10€ each on a stale sandwich and a drink. 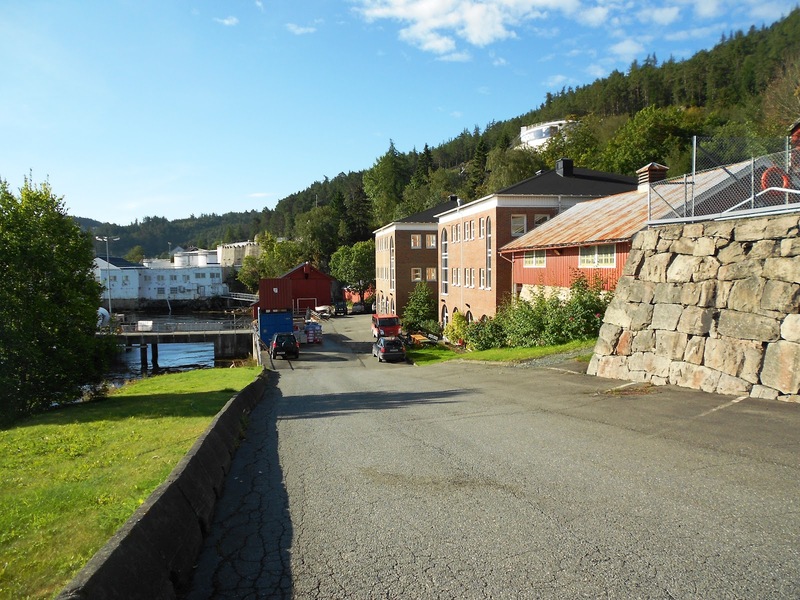 Norway is not the cheapest country. Just as we sat down at the last table big enough for 6 people, the skinny ginger haired man in the black t-shirt nursing a pint of beer at the next table turned knowingly towards us. It was our cook! The one we had said goodbye to after breakfast, as we left the field station just 5 hours earlier. He was on his way to a well-deserved vacation in Turkey. I hope the poor fellow does not spend the whole time expecting us to jump out and surprise him there too, as, really, there is no escaping us. After 3pm, our new flight, now to Copenhagen, departed without incident, save for being about 10 minutes late. I presume the same can be said for Morten's later fight to Bergen. The upshot of the slight lateness of the flight, is that by the time we landed in Copenhagen, our flight to Paris was boarding. And it there is this GINORMOUS shopping area between the different arms of the airport. Your gate is B-15, they told us. GO! So we went. It is not easy to run in shoes that have no backs of the heel, so I lagged behind. When we finally got to the B wing, on the monitor, there was no flight boarding, finished boarding, or about to start boarding at any point within the next hour at gate B-15. Curious. Hmmm. At the next bigger monitor, though, I saw that boarding for our flight was underway at gate D-2 (another eon away). Unfortunately, Manon and Morgane had already sprinted down to B-15. So Briva charged after them, while Annick and I and Briva's purse and carry-on ran on to D-2. They all caught up with us towards the end. There was one dark moment when, seeing on the monitor that our flight was closing and being confused by a badly placed sign, I sent the whole lot of us down an incorrect flight of stairs. And then back up it. *wheeze* But we made it to D-2 in time to be the last people to board the flight. Save for the 4 other people the flight sat around waiting 10 minutes for, before waiting another 10 minutes for straggling baggage. The last minute gate change turned out to be due to the knock-on chaos from Schiphol and because SAS had at the last moment conjured up a bigger plane to absorb the large number of EU passengers with suddenly cancelled flights. They must have made a mint yesterday. Word to the wise, though, do NOT buy a sandwhich on an SAS flight. Gnawing off your own wrist in hunger would be cheaper and more pleasant than the tasteless, colored goo within an alleged bun that was somehow simultaneously soggy and crumbly that I spent yet another 10€ on. On the other hand, if it was food that I ate, it was good that I ate it. The airport sprinting was not yet over. 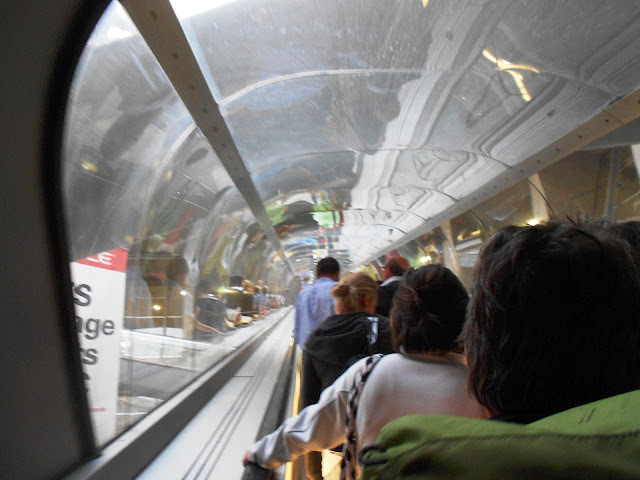 We were still going to have to get from Terminal 1 to Terminal 2G at Charles De Gaulle. And even though we landed at 7:30 pm and did not dawdle (and did in fact do a bit of jogging and weaving in and out of the slow and the stopped on those moving people belts), we got to 2G, rebooked the last cancelled leg of our journey, and got through security exactly 1 minute before our flight started boarding at 8:55 pm. 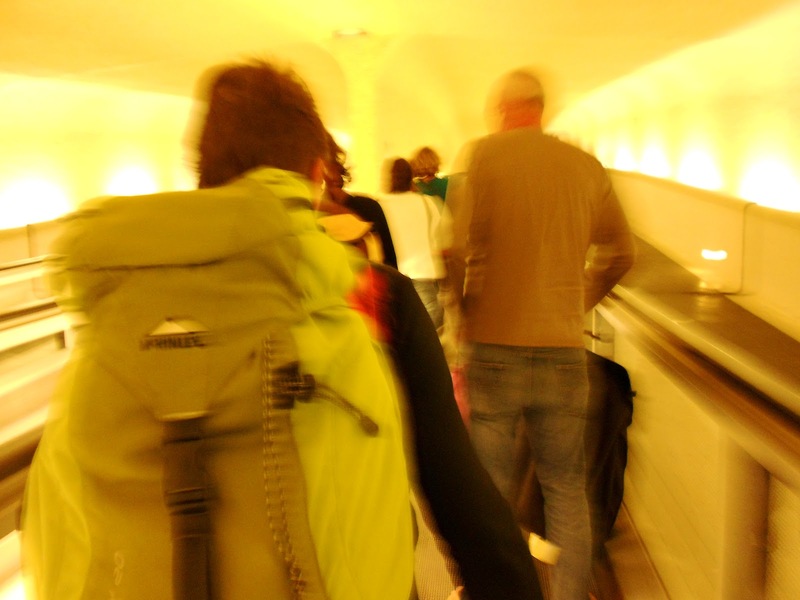 Aug 29 2012k- The long, mad dash out of Terminal 1. 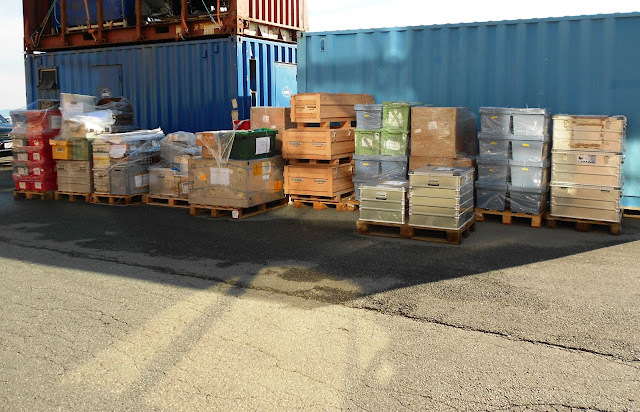 Finally, exhausted, at 10:30 pm, barely able to comprehend that it had been this morning and not a week ago that we'd packed up the frozen samples and left Sletvik, we landed in Brest. Our bags even got there, too. A big crowd was waiting for Manon, Briva, Annick, and Morgane. Manon's friends even showed up with a huge, beautifully made, impeccably neat sign that said (in French): Manon, without you it was tough! Not wanting to interrupt the happy reunions, I snuck quietly out to my car, pleased to find it still there, and still capable of starting. Now to catch up on sleep, write some reports, and get all the samples analyzed. And figure out what it is we learned about food web structure and the production, export, and recycling of fast-sinking particles in the upper ocean.